Several Northern Michigan wineries get a shoutout in this article, including Brengman Brothers, Black Star Farms, Hawthorne Vineyards, Rove Estate, Brys Estate Vineyard & Winery, Mari Vineyards and Shady Lane Cellars. Leelanau winemaker Nathaniel Rose won eight awards at last week’s San Francisco Chronicle Wine Competition. The event is billed as the largest competition of American wines in the world. The 2017 event received 7,000 entries from 28 states. Rose entered eight wines under his own Nathaniel Rose label. All eight garnered prizes. Well, you can tell we've been out of the video podcast game for awhile. Our camera dies mid-podcast, causing Cort to get all flustered; the lighting is horrible; the titles were misbehaving; and there are a whole lot of false starts and giggles. But hey, we'll get the hang of it eventually. (If this doesn't make you want to watch this podcast, what will?) Anyways, in our triumphant (?) return to video podcasting, we each pick two standouts from the Michigan Wine Competition's Gold Medal Reception. If you were there, what were your favorites? Come talk about it. It's been a little while since our last WIOG! 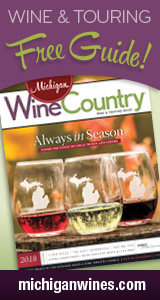 This edition of WIOG features wines we tried during the Michigan Wine Showcase last month. Since we end up tasting a LOT of Michigan wine (you may have noticed), WIOG is our attempt to give you an idea of some selections that you may be interested in checking out based on what we've been experiencing. Cheers! Brys Estate 2013 Naked Chardonnay: bright acid, pear and peach, fruit really shines, long finish. Got your own tasting notes? Come join the discussion on our Facebook page! We are now a zero net meter operation. The rumor from our installer says that we are the first 100% solar powered commercial winery in Michigan. Congrats to Brengman Brothers Winery for this eco-friendly milestone! Join us virtually as we visit a sparkling wine wonderland with Larry Mawby, venture into a cave o' wine with Black Star Farms' Lee Lutes and more during the recent Leelanau Peninsula Wine Trail Media Weekend! What are your favorite stops on the Leelanau Peninsula? Come tell us about it! After this winter, we could use some good energy directed toward our state's vineyards! That nip in the morning air, golden grapes freckled with brown specks, grape leaves on the verge of turning color all signal one thing: harvest time. Some wineries like St. Julian have brought in all the whites except Riesling. Chateau Chantal will head to the fields this week. Red grapes everywhere are still hanging to soak up every last ray of sun before the first frost. Which of these wines have you tried? Come talk about it on our Facebook page! Crain Hill Vineyards in Leelanau County is touted as the first in Michigan to run 100% on solar power, and a start-up energy business sees an opportunity for homes and farms because of the steep price drops to install solar in the last year. A look at the eco-friendly efforts at Crain Hill Vineyards on Leelanau Peninsula.